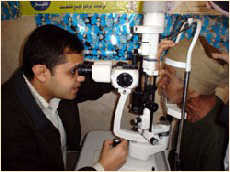 an eye care center in the Upper Egyptian province of Minia, one of the poorest areas in Egypt. The project will be implemented in cooperation with our largest Egyptian partner, CEOSS. Horus Hostital, formerly known as the Community Eye Care Center, operates as a not-for-profit clinic, bringing affordable, high quality eye care to the residents of this governorate, especially to children and women, who are the customary victims of exclusion and neglect. Once fully established, it will serve the area that includes Minia City and about a 100 surrounding villages. training and technical support. This clinic is planned to be a model of an efficient, humane and ethical patient management system in the eye care center that will set new standards for other healthcare institutions in the area. Several donors, in addition to USAID, have provided support for the first phase of the eye clinic’s establishment. This phase includes the establishment of two examination rooms, one operating room and a system for mass examination and referrals from Minia city and surrounding villages. A mobile health unit will survey the surrounding villages and refer the patients to the main clinic.